GetResponse online marketing platform helps entrepreneurs build targeted contact lists, send high-impact newsletters, and follow-up campaigns. It offers marketing automation, CRM, webinars, responsive email design, hundreds of ready-to-use email templates, landing page creator, and useful statistical analysis tools. 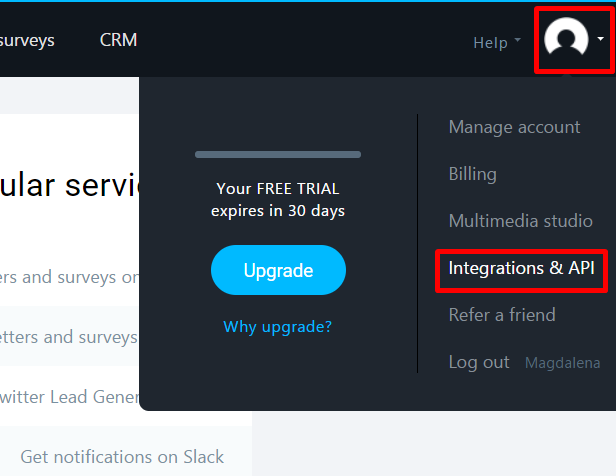 Step 2: Choose GetResponse from the list of available integrations, and select the widgets, on which you want to install the integration. Step 3: Add a description (an alias) which will help you to recognize your new integration. Select service you have. 1. GetResponse - to finish integration you have to paste API Key which you copied from your GetResponse account. A new window will appear. Choose the campaign you need. 2. GetResponse 360 - apart from API Key and campaign, you will have to give your domain URL, too. Step 4: To create this integration, you will have to log into your GetResponse account. Step 5: Go to API, and click generate API key. Step 6: Name your key and click "Generate". Step 7: Go back to customer CallPage panel, and write the API key, select "Campaign" and click "SAVE". Your integration is ready! Just remember to collect emails from your potential customers because only then GetResponse will recognize them as leads.